Calligra Team Pleased to announce the release of New release 2.8.2 of the calligra suite,caligra office suite is complete Open source and free to use and it mainly for Linux / BSD Operating systems. 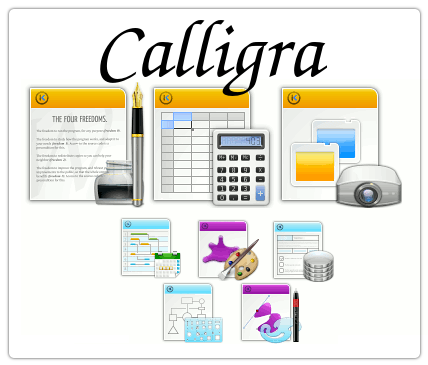 calligra contains all the applications such as word,PowerPoint,Spreadsheet,flow and planning.callibra is better than MSoffice 2003 and Libreoffice in displaywise and it can open all formats of office including .docx,pptx,xlsx. Move Export to PDF command to the Export menu section instead of the Print section for conformance with other office suites. Fix “Missing import filter” bug when saving if not extension is specified. Use native file dialogs on Windows. Make Rich Text property false by default for Text Editor form widget. Rich Text often causes misbehaviour. Fix resetting the slider spin box when double clicking on it. Ignore tablet press/release events which did not produce any sane buttons. Added support for ‘evdev’ tablets. Make Krita auto-recognize axes labels of Evdev tablets. The labels are stored in a special property of the XInput device. Recognize Surface Pro 2 tablets on Windows. Fixed size of predefined images. Set default gradient to alpha. Clean up the layout of the Transform tool. Hide unused settings for stroke in the Path tool. Fixed memory leaks in brush handling. Fixed memory leaks when resources fail to load. Fixed memory leaks when creating strokes. Don’t crash on creating a file layer in Krita Gemini. Fix loading plugins for Krita Gemini. Save tags with special characters properly. Fix removing of tags, don’t load or save dummy tags. Add import for PSD layer groups. Fix startup of Krtita Sketch and Gemini.